"Let justice roll down like waters...."
Fred Clark makes an interesting point, to which I would just add: there isn't a whole lot of punishing going on in the Hebrew Scriptures. I know the "popular" image of God in the Hebrew scriptures is the vengeful one, the "sinners in the hands of an angry God" which is so much a part of American culture (and one more reason the past isn't over, or even passed). But, as the Yale website indicates, everything is subject to interpretation; and re-interpretation. And my starting point for this would not be the prophets nor the histories in the Hebrew scriptures, but the wisdom literature: specifically, the book of Job. Do we consider Job when we consider the question of punishment? No, if only because the prologue to Job makes it clear Job is not being punished for anything, despite what his friends think. Job is not being punished because Job is righteous; but also because Job's life has become the game board in a cosmic game is being played out between God and Satan. There's something, indeed, almost Hellenistic about the book of Job; but I digress. The point is, nowhere in the book is Job's suffering properly identified as punishment; in part because it isn't, in part because such punishment is manifestly unjust. As much as Job is a very Hebraic meditation on the question of theodicy (and in Hellenistic terms, on the issue of fate and our mortal relationship to the immortal and powerful gods), it is a meditation on the nature of justice. Is what happens to Job unjust? Only in the sense that justice is something meted out to those who have violated some standard of conduct. But that's not the only sense of justice espoused in the Hebrew scriptures. The primary discussion of justice is conducted among the prophets, and their subject is the apostasy of Israel that leads to the fall of the two kingdoms and the Exile. But the sin of apostasy is not punished by God through the Babylonians. It is not God who punishes Israel at all; it is Israel who punishes itself, because God leaves them to the consequences of their actions. Indeed, what choice does God have? God neither punishes Israel, nor removes God's magic shield of protection from Israel. God just tells Israel, through the prophets, how badly they screwed up, and what the consequences of their behavior is gonna be. Oh, yeah, and in several famous scenes scattered throughout the works of the prophets, God challenges Israel to point out where God failed and caused Israel to collapse. It's not about punishment; it's about consequences. It's not about justice as punishment for wrongs done, or as suffering before lessons are learned. It is about justice as mercy, and redemption. God is not just because God abandons Israel. God is just because God restores Israel. Justice is not a consequence free life. Justice, as Martin Luther King said, is the telos toward which the arc of the universe is bent. Fred references one of the semeia of John, the man born blind whose sight is restored. The disciples think justice is punishment for sins done, by the man or his parents. 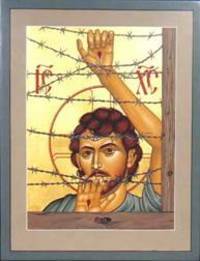 Jesus knows that is not justice, and he uses the man as a sign, a semeia, of God's work (as all the semeia are meant to be seen in John's gospel). In the synoptics the healings and other signs of God's power are dunamis, or acts of power. What they show, time and again, is that justice is accessible to us all, and justice is most important as an action, not an abstract concept. Especially in the synoptics the dunamis reveal that justice is active, not deliberative. When Jesus makes the lame walk and the blind see, he never does it because they deserve his attention, but because they deserve our attention. Do you see this woman? How do you see her? As a prostitute? A female? A child of God? The distinction is crucial; but it is crucial to us. If justice is going to be done on this earth, it must come from us. It does not fall down on us from God, any more than punishment falls down on us from God. What comes from God is justice; what we suffer is the consequences of our own actions. Can we complain against God for not saving us from ourselves? The children of Abraham have been doing so almost since the first children of Abraham. Does that make God unjust? No. Only our definition of justice is unjust; especially when we limit who justice is done for, or think of justice as who it is done to. Made me think that my (very white) daughter has several hoodies in her closet; and even my (equally white) wife has one or two (I have two gray seminary sweatshirts, and an orange one from UT-Austin; no hoods, though, thank the lords and the low creatures). Guess I should confiscate them, huh? Just for their safety, and to reassure people the outrage over the failure of the police to even investigate the shooting of Trayvon Martin, isn't about race. 'Course, this guy (in the photo) is just askin' for it. I've never seen him on the show without a hoodie. Thug. Probably a racist, too. *To its credit, NPR pointed out those have been on sale long before they became part of this controversy. The joke at my UCC seminary was about the graduate who came to face his ecclesiastical council in order to be ordained, and confessed that, due to seminary, he had lost his belief in God. But it was the UCC, so what could they do? They ordained him anyway. It's a jest on the UCC, but also on seminary. In his biography of Martin Luther King, I remember a passage where King was surprised to find one of his seminary professors attended church. Why? Because the professor so challenged King's church derived beliefs, the doctrines he brought to seminary from his childhood, that King was sure the man was an atheist. Seminary is not "Bible College." It is not a place to have your Sunday school aphorisms affirmed and your faith reassured. There was always some lively speculation in seminary as to which professors were secretly atheists, and a general reluctance to put too much stress on piety, and not enough stress on intellectual foundations. Which I thought of while I watched this story on "UP with Chris Hayes" this morning. I don't want to pass judgment on Mike Aus (his is a non-denominational church, I'm not sure what title he carries, if any) . But the discussion of how he lost his belief (not his "faith," I would argue; he simply transferred that to something else. Watch this discussion from earlier in the show, and replace "trust" with "faith," a perfectly legitimate transfer as the Greek word in the Gospels translated as "faith" can be equally translated as "trust." You'll see, as Anthony points out here from time to time, that we all "believe" in something. The question is, do we ever examine the roots of that belief, be they science, or religion?) is interesting because he credits two guests on the show: Richard Dawkins and Stephen Pinker. Dawkins I've written about before; and Pinker, too, to a lesser degree. Later in the show Pinker defends his thesis that human life is "progressing" towards at least non-violence, first by pointing out violence is down since 1946 (probably due more to the Pax Americana than to "progress," but I digress) and that this decline in violence is due to institutions, not individuals. Which is interesting on two fronts: one, it tacitly accepts the concept of "original sin," at least as espoused by Christopher Hedges and Reinhold Niebuhr, if not by the local Bible thumper. Two, Mr. Pinker would be hard pressed to exclude the Church, at least in the West, from the institution most to be credited for the improvement he argues has, and is, occurring (and perhaps he doesn't exclude it. My point is the same, with or without his concurrence.). We have nothing to fear from those who do not believe in God; we have much to fear from those who do not believe in sin. The concept of sin is a stark acknowledgment that we can never be omnipotent, that we are bound and limited by human flaws and self-interest. The concept of sin is a check on the utopian dreams of a perfect world. It prevents us from believing in our own perfectability or the illusion that the material advances of science and technology equal an intrinsic moral improvement in our species. To turn away from God is harmless. Saints have been trying to do it for centuries. To turn away from sin is catastrophic. Religious fundamentalists who believe they know and can carry out the will of God, disregard their severe human limitations. They act as if they are free from sin. The secular utopians of the twenty-first century have also forgotten they are human. These two groups peddle absolutes. Those who do not see as they see, speak as they speak and act as they act are worthy only of conversion or eradication. 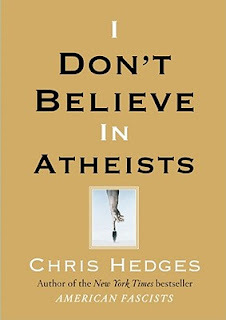 Chris Hedges, I Don't Believe In Atheists, New York: Free Press, 2008, p. 13-14. As if to underline Mr. Hedges point, Richard Dawkins declared everyone who doesn't think as he does unmutual . 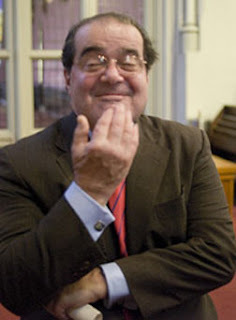 He told Chris Hayes that all Roman Catholic politicians should be challenged on the doctrine of transubstantiation; those who didn't refute it should be humiliated for believing such an obvious myth. To his credit, Chris Hayes and the rest of the more Jeffersonian panel considered that a disastrous concept of civility. But Mr. Dawkins' sentiments were perfectly clear. We really have reduced all considerations in public life to matters of economics. The Paul Ryan budget, the concerns over the deficit, the outcry about funding Planned Parenthood or even providing insurance coverage that might pay for contraceptives, is ultimately all about money, and not about people. Money trumps every question of spirituality or human value, because it is only money that matters, it is only money that can be quantified, counted, assessed, and truly valued. It is perfectly clear, across the Western world in the throes of an economic crisis, that people are too damned expensive, and saving money from the people who would consumer is the greatest good and highest duty of society. In some recent speeches Obama has sounded the note emphasized in that second paragraph; but who has echoed it for him? And why is this kind of talk so important? Why is spirituality so valuable to modern democracy? The Irony of American History, by Reinhold Niebuhr. Charles Scribners' Sons, New York, 1952, p. 21-22. None of this came up among the public intellectuals and pontificators on Chris Hayes show Sunday morning. None of these ideas were presented as fair challenge; discussed; even considered. Nothing pierced the rather simplistic bubble of the conversation aside from Mr. Dawkins' outrageous demand against Roman Catholic politicians. I found, after a while, that I couldn't look at Stephen Pinker and not think: Here is a man of extraordinary privilege sitting at the very pinnacle of a pyramid that is literally international in scope and reach and which provides that privilege to him, out of all the billions of human beings alive in the world at this moment, and all the millions of Americans and Canadians who might, out of all the other billions on the planet, have any hope of laying claim to the same privilege and comforts Mr. Pinker enjoys. And he is absolutely Panglossian in his assertion that this is the best of all possible worlds and it's only getting better and violence is going down as we all become better people thanks, of course, to Western civilization (he's not enough of an anthropologist to give any attention to any other form of civilization). From his perch he gets to scan human history and see nothing but improvement which leads inevitably to his comfortable place, and which will, with his added insight and wisdom, soon guide us all to the new millenium of human perfectability. It's not just the Calvinist and Niebuhrian in me that laughs at his presumption, it is the knowledge that any situation, when you simplify it enough, looks tractable and even eminently explicable. Mr. Pinker is no wiser than Gulliver, no more thoughtful than Pangloss, no less naive than Candide. He assumes his enormous privilege is deserved rather than wrenched from the mouths of children he will never know, who will die because of a system that ignores, if it doesn't exploit, them, just as much as it serves the every comfort of the Stephen Pinkers of the world, and it does the latter only by doing the former. From Mr. Pinker's perch, there are signs of progress; from the perch of the children shot by the US Army Sergeant? Or dragooned into involuntary military service by Kory? Or who will die of starvation, malnutrition, dehydration, across the planet, at any given moment? What progress in the affairs of common humanity do they enjoy? And just this week I hear doctors warning that an over-reliance on antibiotics may bring an end to medicine as we know it, because of the "superbugs" which prove ever more resistant to those very antibiotics. Technology that has made life such a blessing, may soon leave us where it found us: having tasted paradise, and then cast out again, forevermore. Technology which has already made life a blessing for those on one end, makes it a hell on earth for those on the other, right down to the discarded electronic waste with its heavy metals and poisons that decay in foreign (to us) landfills where people not us, live. Global warming is not the result of bushmen in Australia burning campfires, yet they will be affected by it. Resource wars for water and oil are predicted to be on the horizon, the product of the very progress in science and rise of civilization which Mr. Pinker avers is responsible for the decline in human institutional violence. Surely the people are grass! But that's alright, because the reliance on violence is declining! That could as much be because the long arm of the powerful, as it was for the Romans in their heyday, is so much longer and more powerful than it is for the recipients of that violence. How does one counter a tank, except with an IED? How does one counter a drone, if at all? How does one shoot back against a bomber, or a cruise missile? Who, in the world, truly possesses the weapons of mass destruction, and who possesses only the ability to kill at best many at a time? Three planes on 9/11 killed 3000 people. How many millions did we manage to kill in retaliation? The great violence of the two world wars was more because of the ability of the two sides to inflict massive injuries on each other over a sustained period. The battles since have been far more one sided. Statistic alone do not indicate the presence of the trend Mr. Pinker is looking for. And his argument, too, is based on the fact that Samuel Pepys went to a public place to see a hanging, or a quartering, or some other act of violence actually inflicted on another person, as a form of entertainment (as well as an assertion of the power and authority of the State). What's changed now is that we can see such violence 24 hours a day in the comfort of our own homes, and the only difference now is that it's simulated violence. Does that really matter to the audience? Did they really care about the lives of the gladiators any more than fans today care about the lives of "professional wrestlers"? In modern day entertainment, we pretend to hurt people, and even when the violence involves children, we find a good reason for it; or at least we find it entertaining. Perhaps it is better that we don't slaughter people outright for our pleasure; but we still find violence as compelling a subject of spectacle as ever we did. Whether it is real or staged doesn't matter much to us, as we want our faked violence to be as realistic as possible. Even in the movie of "The Hunger Games," the bodies of the children being killed by children were realistically presented as dead, and in some cases their deaths were portrayed as very painful. Do we really care any more about the actors playing the minor roles (the red shirt in "Star Trek," the henchman in any James Bond or other action film; many of the dead children in "The Hunger Games") than the audience cared about the gladiators who were slain? My daughter knew one of the actors in "The Hunger Games" from her school; but she was a minor character, and I can't even remember if she died on screen or not. And let me just back up and say the idea, presented again by Robert Wright on Chris Hayes' panel, that morality comes only from God is not a theological proposition, but a 19th century secular one. It arose primarily out of concern for the rising atheism of the educated (read: ruling) classes, especially in England, who reasoned that if they couldn't subjugate the masses with a fear of hell and visions of sinners in the hands of an angry God, all public morality (read: the social order that keeps us at the top!) might be undone. It had far more to do with the Great Chain of Being than with Moses giving the law to the tribes of Israel, and for Mr. Wright and others to continue to beat this shibboleth as if it were a real (but dead) horse says far more about their ignorance and credulity, than it does about the least knowledgeable believer in any world religion. Even as I divest myself of these opinions (prick me and I bleed a gallon of response), I wonder who I think I'm talking to. Stephen Pinker is comfortable in his amorally moral universe, and Susan Jacoby (also on Chris Hayes) was, frankly, incoherent (not that I was much of a fan). Robert Wright is a spent force in this arena (when he isn't, as Chris Hedges would put it, simply illiterate), no more deserving of serious consideration than Pinker or Dawkins. Pinker declares that the angels of our better nature are being wooed on a world-wide basis by institutions? And where do those institutions come from, and from whence comes their beneficent influence? 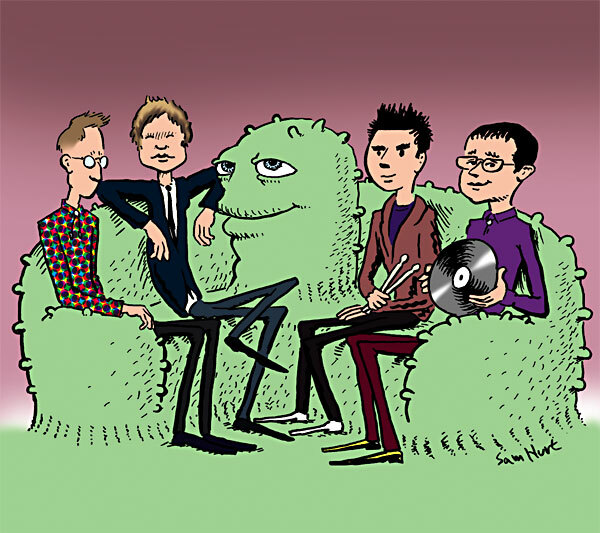 Space aliens? Selfish genes? The progress of Western civilization? Or is it more likely from human beings, and human nature? Has Pinker so much as heard of Reinhold Niebuhr, so much as read sociology or anthropology? Niebuhr's central insights into institutions and morality absolutely turn Pinker's bland assertions and statistics inside out. And I speak as a serious student of the subjects they think themselves qualified to dabble in. Most other serious students know these "ideas" (I use the word cautiously) aren't worth the effort it takes to refute them, and the majority of the world's religious believers don't give a wet snap what the four of them say, or who they say it to. This is a conversation conducted by a small group ignorant of everything except their own preconceptions, impervious to understanding and of no real consequence to the course of human history. Not, at least, when it comes to the very human realm of the religious. I know I'm not Kierkegaard; but neither am I taking on Hegel or the State Church. And I am reminded of two things; or is it three? "The core of most religions is not doctrinal. In non-western traditions and even some strands of western monotheism, the spiritual life is not a matter of subscribing to a set of propositions. 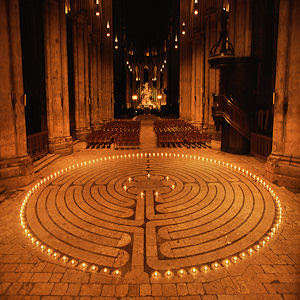 Its heart is in practice, in ritual, observance and (sometimes) mystical experience . . . "
And: Those who can't do, teach. Or, at least, they talk a lot; without getting very much done. These are not, of course, refutations. No idea is ever refuted, ever finally put to rest; no idea, good or bad, is ever ended. But at some point it is apparent that there are discussions worth having, and discussions not worth bothering with. And there is a reason Kierkegaard wanted his audience to eventually leave behind the philosophical works, and take up (and truly learn from) the edifying discourses. So this is not a refutation; consider it more of a rejection. Again. Mimi is right in her comment below; I would be better off ignoring this subject, unless I can turn some good out of it. And that good would be to make efforts to refocus the discussion away from the supremacy of materialism and back toward the necessity of spirituality. And maybe one day I'll learn to leave it lay where Jesus flang it. I don't doubt for a moment the Sanford police did a poor job investigating this crime. As far as I can tell, they didn't so much as check his cell phone to try to ascertain his identification, or to see if he was talking to someone just before the shooting who could be a witness. But if they didn't arrest Zimmerman, it's because Florida law says they can't. Whether the Florida legislature wants to reconsider that is still uncertain. But it couldn't be a clearer mandate to shoot someone, and then claim a "King's X" that can't even be challenged in open court without extreme difficulty; mostly because this statute makes it almost impossible to get the shooter into court. *In Texas, by contrast, it is a defense to prosecution, but not an immunity from prosecution. This is not to justify the Texas statute, but to underline how extreme the Florida statute is. In his 911 call, Horn cited a newly enacted Texas law, the "castle doctrine," which authorizes the use of deadly force during a home invasion. But Sen. Jeff Wentworth, who wrote the law, said it did not apply to Horn's case. "It was not an issue in this case other than him saying incorrectly that he understood it to mean he could protect his neighbor's property," said Wentworth, R-San Antonio. He said the castle doctrine simply didn't apply because, although the burglars were running across Horn's lawn, Horn's home wasn't under siege — his neighbor's home was. "It comes from the saying 'A man's home is his castle,' " Wentworth said. "But this wasn't his castle." Mr. Horn said he "feared for is life," but he was inside on the phone to 911 when he said that, and he stepped outside and shot the two men in the back as they fled his neighbor's house. "Some people on the grand jury will sympathize with him," said Adam Gershowitz, a law professor at South Texas College of Law. "Maybe he shouldn't have done this, but he was acting in a way a lot of people feel." But that does not mean he won't be charged, Gershowitz added. I don't know if the grand jury sympathized with Mr. Horn (very likely) or if the DA got the result he wanted (also very likely). There was also the fact the two men were on Horn's yard when the shots were fired, although one was running away when he was killed; and a police detective, in response to the 911 call, had just pulled up in front of Horn's house when the killings took place. Mr. Horn also made it quite clear to the 911 operator that he was going to kill the two suspected criminals, and it was only when he stepped outside with the shotgun, that he found them on his property (the fact that they were on his property may well have gotten him within the purview of the law). Of course, it didn't hurt that the grand jury was white, and the two men killed were not. Funny how these laws don't apply in awkward cases, though, isn't it? I guess we'll have to start talking about activist police, or grand juries, or something. At any rate, Joe Horn had to testify before a grand jury. George Zimmerman is in hiding, but only because Trayvon Martin's family has decried this gross injustice, an injustice that is as much a creature of Florida law, as it is of Florida culture. NPR woke me up this morning telling me tomorrow would be "Woodstock for Atheists," and my first thought was: "Who cares?" Not "who cares?" because the event shouldn't be reported on, but "who cares?" because the entire raison d'etre of atheists, it seems to me, is to affirm among themselves that theism is something to be "a-" about. Which I've always thought was kinda funny. I mean, if it weren't for theism, what would you affirm you didn't believe in? Love? Beauty? Jumbo shrimp? And apparently, as I always suspected, it's because of us believers. I guess. If an atheist doesn't get a job, or loses a job, because of their professed atheism, I would have a problem with that. I don't like that politicians are called on, more and more, to describe their religious beliefs in terms acceptable to the lowest common denominator, and to end every public utterance with "God bless you [as if we've all sneezed] and God Bless the United States of America" [as if we suffer from a national case of the sniffles]. I am fine, in other words, with fewer expressions of religious sentiment in public life, and don't confuse those sentiments with religious belief (which is why I'd prefer to see and hear fewer of them.) But what is atheism, that it should be celebrated at it's own "Woodstock"? Is it non-belief on steroids? Is it militant non-belief? Seems to me the valid theological stance, at least since Kierkegaard in the mid-19th century, is that non-belief is the human default setting, and belief is the activity. Isn't it their argument that atheism is simply the human default? If so, isn't "celebrating atheism" a bit like celebrating being a social animal, or walking upright? But then they are like the dog chasing the car: what do they do if they catch it? I've just started reading The Girl with the Dragon Tattoo, a book set in contemporary Sweden. One character is described as Muslim, but as an adult he "of course" no longer believes in God. Oddly, this doesn't make him an atheist. He just lets the matter go, in other words. Another character, a young girl, tells her father she's started attending church. He's not exactly pleased, but he doesn't seem particularly offended by it. Is he an atheist? Or simply a non-believer? Which is kind of where I'm going with this: if you are an a-theist, then you have tied yourself rather tightly to theism. If theism truly doesn't matter to you, why do you declare yourself an a-theist? Why not just drop the whole matter and go on about your business? I mean, what would atheists do as atheists together? Discuss the non-existence of God? The Christianity of TV evangelists and mega-church preachers and pulpit thumpers, is not the Christianity of the world. And Christianity itself is not the only religion in the world. Christians are no more identified solely with people like Dennis Terry than Muslims are identified with the assassin recently shot to death by police in France. Most of us are anti-terrorist, for very good reasons. But we don't feel the need to gather and proclaim our anti-terrorism, and to insist that one day anti-terrorism will be the norm and terrorism will cease to exist. If only because, frankly, it won't. And the only absurdity in that comparison is that religious belief is not to be equated with terrorism. Well, not by intelligent people, anyway. The atheists and the fundamentalists speak in slogans. Atheists ridicule magic, miracles, and an anthropomorphic God. They remind us that the world is not 6,000 years old, that prayer does not cure cancer, and that there is no heaven or hell. But these are not thoughts. They are self-evident tautologies. These two camps never step outside their narrow intellectual boundaries. The atheists believe they know religions' inadequacies, although they have never investigated religious thought. They delight in critiques that are, to any first year seminarian, shallow and stale. Hitchens assures us that "the unanswerable question of who...created the creator" has never been addressed by theologians. Theologians, he says, "have consistently failed to overcome" this conundrum. This is the declaration of an illiterate. Aquinas, along with many other theologians, addressed at length the issue of who created the creator. God, Aquinas argues, is not an entity. God is not a thing or a being. Creation is not an act of handicraft. Creation is a condition there being something rather than nothing. Creation didn't happen long ago. Creation is constant in human existence. It is part of life. And this is why "creationism"--the belief in a single, definitive act of invention by an anthropomorphic god--is pseudoscience and pseudotheology. But stepping out of the cartoonish and childish taunting of religion to a discussion of the writings of Aquinas, Augustine, Paul Tillich, Karl Barth and Reinhold Niebuhr is beyond the capacity of these atheists. They haven't read them and they don't want to. 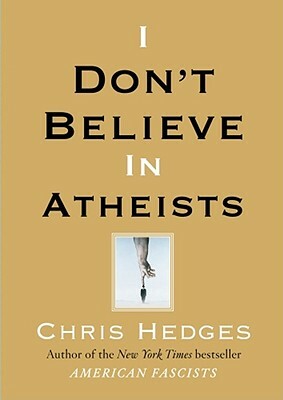 Christopher Hedges, I Don't Believe in Atheists, New York: Free Press, 2008. pp. 70-71. To be fair, this isn't necessarily the attitude of the people interviewed by NPR. But I doubt any of them could identify the major works of any of those writers, much less their major ideas. They are too busy being "against," and identifying themselves as such, to be for even the acquisition of knowledge. Which is where I really kind of wonder about such professed atheists, and their profession of reason and rationality: why do they bother? Zimmerman told the police he was in his truck, stepped out of it to check the name of the street he was on, and then Tayvon Martin jumped him from behind. Zimmerman had to defend himself, so he shot the 17 year old. The 911 tapes tell a different story: Zimmerman saw Martin, saw Martin begin to run from him, and he got out of his truck in pursuit. When he caught up with Martin, he shot him. "What happened" is clear from what Zimmerman told police. A friend of Martin's was on the phone with him as he noticed Zimmerman, and as he walked quickly (he told his friend he wouldn't run) away from Zimmerman, who pursued him. She heard Martin ask "Why are you following me?" and heard Zimmerman (presumably) say: "What are you doing around here?" Almost immediately after that, Martin was shot and killed. The police didn't bother to check Martin's cell phone for recent calls, or to notice he was on the phone as he was shot (making the person on the other end of that call a potential witness). They took Zimmerman's story at face value even though it contradicts the 911 tapes. To sum up: for Zimmerman's story to be true, he had to get out of the truck to tell the 911 operator the name of the street he was on, get back in his truck, get out again to pursue Martin, who somehow at that point vanished from running down the street away from Zimmerman, and appeared behind him, threatening Zimmerman so that he had to shoot to defend himself. 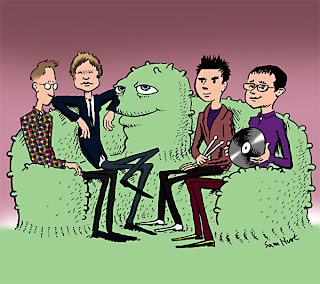 The Dept. of Justice has noted it must have evidence of intent in order to pursue federal charges; that negligence (such as the gun going off in a struggle, without Zimmerman intending to fire) cannot be charged under federal law. But Zimmerman's statement to the police is that he intended to fire. If Zimmerman changes his story now in order to evade federal prosecution (such as saying the shooting was accidental), he loses all credibility (not that he should have any, in light of the evidence that contradicts his statement to the police). And the authors of the so-called "stand your ground law" argue it doesn't protect Zimmerman from a situation he placed himself in. However, Jeffrey Bellin's analysis of the requirements of the law in Florida points out raising the defense puts a burden on the prosecution: to disprove the defense. Critical to this determination will be evidence reflecting: how the confrontation began and how the suspect acted after the confrontation (prosecutors often look for actions such as flight or a cover-up that indicate a "consciousness of guilt"). Perhaps most critically, investigators will compare all the evidence (physical and otherwise) with the suspect's statement (if any) about what happened. Which, I think, is where the evidence known so far gets Zimmerman in trouble. His statement to police contradicts the 911 phone call he made; and the statements of Martin's girlfriend contradict Zimmerman's statement, too. The evidence of the phone calls indicate who started the confrontation, and who escalated it, and that Zimmerman decided, after he'd fired, to claim self-defense. There is also the absolutely grotesque dereliction of duty evident in the Sanford Police Department's handling of the case. Trayvon Martin was treated as a John Doe, despite the fact he had a cell phone which could have been investigated for information (the family brought out the story of Trayvon's girlfriend, not the police). Trayvon was tested for drugs and his criminal background checked, not Zimmerman's. And in all of this, the family has called consistently for one thing: the arrest of George Zimmerman. Not his conviction, or even his execution: simply his arrest. Which says a lot about the nature of the Martin family, but also a lot about race in America. The City Manager of Sanford, Florida was on Lawrence O'Donnell's show last night, and while he admitted the Police Chief of Sanford serves at the pleasure of the City Manager, he refused to consider firing Bill Lee without a full investigation: in other words, not until sometime in the far future. Which sounds reasonable, in one sense; in another, it indicates the politics of this town in Florida. Even City Managers have to take politics into account, and right now George Zimmerman is seen as white (he claims Hispanic), and Trayvon Martin is a dead black boy in a hoodie. A white family would be demanding rough justice; a black family knows all they can demand, is justice. They are right to ask for no more than that. But they also understand society entitles them to no more than that. A white family might well consider they are entitled to vengeance. The arguments for the "stand your ground" law in Florida were based on that sense of entitlement: you have to defend yourself in a situation of threat. The problem is, of course, what constitutes a "threat;" and also, who is threatened. 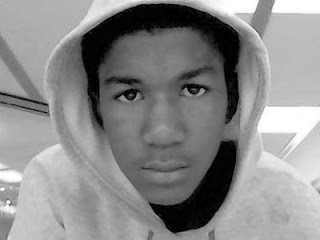 If Trayvon Martin had also had a gun, and ended up shooting George Zimmerman, does anyone really think he'd be free right now because of "self-defense"? I'm gonna use Athenae to do it: put in my $.02 on The Hunger Games. First, I'm excited by the trailer, as it appears to be a picture and note-perfect representation of the world of Panem as I imagined it. Yes, the name of the country is Panem. It is what is left of the United States after war and global warming have taken their toll on the population and the available living space (think of losing the coasts and the Gulf reclaiming as much of Texas as it once covered. There's nothing specific about that in the book, but it's a fair representation). The world of Katniss (more on the names in a moment) is District 12, a coal mining region that's probably in the Appalachians. There are 12 districts, down from 13. There is a Capital, probably in the Rocky Mountains (none of the familiar names apply anymore. Again, more on that in a moment. ), and every year there is a "Reaping," where two children of a certain age group (see the trailer or the books for such details) are chosen by drawing to go to the Hunger Games, and fight to the death in an arena. The survivor is excluded for life from the Games, and is set for life, as well. Their district is rewarded with riches (usually food) for a year, until the next Games. At the time of the book, this has been going on for 75 years. All wealth and power flows to and from the Capital. Districts most supportive of the Capital benefit the most, and each district provides good, or Peacekeepers (soldiers), or fuel (coal), etc., to the Capital. Think of all roads leading to Rome, except Rome is set off from the rest of the empire, the empire is divided into distinct districts, and travel between districts is impossible, except with permission of the government in the Capital. All means of transport are controlled by the Capital, too, as well as all energy supplies (electricity, etc.). The comparison to Rome, you may have guessed, is not accidental. The country is Panem. Many of the people in the Capital have Roman names. Caesar. Cressida. Troilus. Katniss is named for a plant that grows in District 12, as is her sister, Primrose (Prim). It's never explicit, but Katniss is cat-like; she is practically "cat-ness". She is a hunter (a predator); she is a loner (she can barely make an emotional commitment to either of the two boys who feature in the story); she is a survivor (9 lives). She also hates her sister's cat, who returns the sentiment. They are too much alike, you see. But Katniss is who she is because of Panem and the Games. Her father dies in the mines when she is young, her mother withdraws in shock and pain, and Katniss has to hunt (illegally; she's bascially poaching the king's (Capital's) grounds, outside the fence that surrounds District 12) to keep the family in food. Growing up too fast with too many burden, she is forced into the Hunger Games because her sister Prim, the first year she is eligible, is chosen. Katniss volunteers to take her place. Note this process of selection is called "The Reaping." Those chosen are "tributes." The games are to remind the Districts who is in control. They are run by and for the Capital (whose children are never subject to selection). Reaping means both harvest, and reaping what you sow; a reminder to the districts of the price of rebellion; even after 75 years. "Tribute" is rather more obvious. The YA (Young Adult) aspect of the novels is that Kat is used, almost from the beginning, as a pawn in several other group's games. Like a teenager, she is held responsible for what she does, but she's never quite let in on what's going on (think Harry Potter and Dumbledore, without Dumbledore's benevolent watchfulness over Harry, or Harry's chance at resurrection). But the even more interesting aspect is the references to Rome. The books also had some fortunate timing for the author in terms of catching the zeitgeist, since perhaps the core theme is the 99% (the 12 districts) vs. the 1% (Capitol), the poor and underfed vs. the rich and overfed. But this misses the salient, and subversive, point. The overt theme here is that power tends to corrupt. It corrupts not just the Capital, but the rebellion against the Capital. The subvert theme is that history tends to repeat itself, and it does so for the simple reason that we continue to rely on power to further our own ends. That lesson is expressed most clearly at the end of Mockingjay, the third book in the series, when Katniss finally realizes who she must choose, and why, between the two boys who love her. It is not a romantic moment, to say the least. And it happens because of an act of violence, and the justifications for violence, which justifications always have to do with seizing, or keeping, power. Katniss is not interested in power. Rome was. 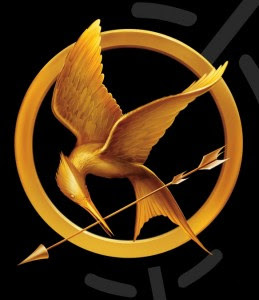 At one point a character in the books makes the connection clear: Panem et circenses. The Hunger Games are the gladiatorial bouts that remind everyone who is in charge (gladiators were slaves, not citizens). Everything flows to the Capital (Rome) from even the farthest reaches of Panem (the Empire); and the brutality recorded in the crucifixion of Jesus of Nazareth, the absolute and brutal imposition of the Pax Romana that destroyed Jerusalem in 70 CE, is reflected in the actions of the Capital over the course of the trilogy. There is a Pax Panem. How clearly does Panem reflect the reality of our world today, with US military bases around the globe and the US Navy that now advertises itself as a "Global force for good", a US Air Force that you would never know flies bombers and drones all over the globe, doing far more damage than one sci-fi plane does benefit? Well, we aren't as brutal as Panem; unless you count torture in Abu Ghraib or in "black sites" around the globe, or the School of the Americas, where we trained the torturers who terrorized the countries of Central America in the 1980's. But these connections take a conscious effort; they don't appear anywhere in The Hunger Games where, as I say, all knowledge of the US and its history have been completely erased. In that way it is only slightly different from the world we live in. In its simplicity (each district contributes only one thing to the whole, a division of labor that is literally impossible) Panem is a child's idea of a country. In its brutality, though; in its ruthlessness; in its determination to keep the flow of goods and benefits confined to the hands of the few who can appreciate them; in its depiction of a Capital where luxury and waste are bywords (at a feast, the attendants gorge themselves, drink an emetic to vomit, and gorge themselves again; else what's the point?, as one character says); it is a true picture of our world. Not that it is any more obviously related to us than Omelas is. We see what we want to see; and disregard the rest. It's not that I disagree fundamentally with Dr. King's observation about the telos of the universe. 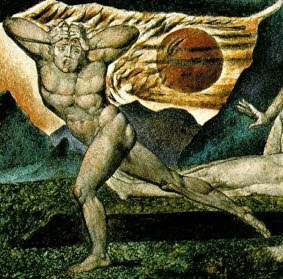 But I teach Greek tragedy about once a semester, and I tell my students the basic Greek cosmology was that logos (reason) imposed order on Chaos, and that order gave rise to what we call the universe (Creation in the Hebrew cosmology, just to make the connection). Chaos, however, was not vanquished, and inevitably will wear down order and the universe will return to its original state. It's a theory I'm more and more inclined to, given that issues I considered settled in my childhood, like contraception, voting rights, even civil rights, are as much in contention now as they were when I was a child. Jim Crow laws were a reaction to freed blacks voting for freed blacks. Now we have an African American in the White House, so the universal fear is of who else might get elected. Before 1965, some voters in Texas would probably have had to pass a literacy test. Same difference. Contraception? Ain't it obvious. Civil Rights? The University of Texas may soon stand in legal circles for the abolition of "affirmative action" in access to education, despite the fact Texas public education is still underfunded and is still unfairly funded (where you live determines the quality of the school you attend, and "vouchers" wouldn't change that for vast swathes of the state). It's hard to say chaos doesn't win in the end. But maybe it isn't that chaos triumphs. Maybe it's simpler, and the evil nature of humanity (which ain't, at the other extreme, necessarily Satan) will always run unchecked unless people of good try to put a stop to it. After all, the question "Who sinned, that this man was born blind?" is not a challenge to the status quo, but a blank acceptance of it. The right answer is not to challenge the assumption of fault, but to ask a different question: "Who dares leave this child of God to languish in poverty, ignorance, want, disease, isolation? When all these things can and should be cured?" The answer, in other words, is not necessarily to oppose evil; it is to not let it get a foothold. The challenge is to how we are to be (if I can express it that way), not merely to how we live, or what life we accept. *Or maybe not, unless Texas is successful in getting portions of the Voting Rights Act declared unconstitutional (not likely, as their attack is based on the 10th Amendment, but it all sure sounds familiar all over again).